WinTingo is a perfect example of versatility and balance that really makes difference when it comes to offering a collection of games. With over 500 titles and superb bonuses, WinTingo has become a friendly place for rookies, profies, and a variety of pokie fans. The set of promotions is updated regularly to keep regular and new users entertained. The casino website has been localized in five European language, including English, Spanish, German, Finnish and Swedish, which in fact means a global coverage for visitors from many countries worldwide. WinTingo represents the best pokies developed by Net Entertainment and Microgaming so far, with all games arranged in categories for a convenient search. The pokies collection incorporates both latest products and an array of classic ones. 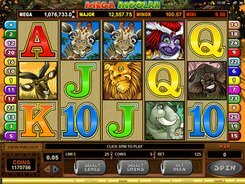 Progressive jackpot hunters will be happy to play Mega Moolah, LotsALoot, Major Millions and other gorgeous progressives that can change your life in an instant. Roulette fans will not be disappointed either, as the casino features a host of roulette variations. Want to beat a dealer and get a total of 21? 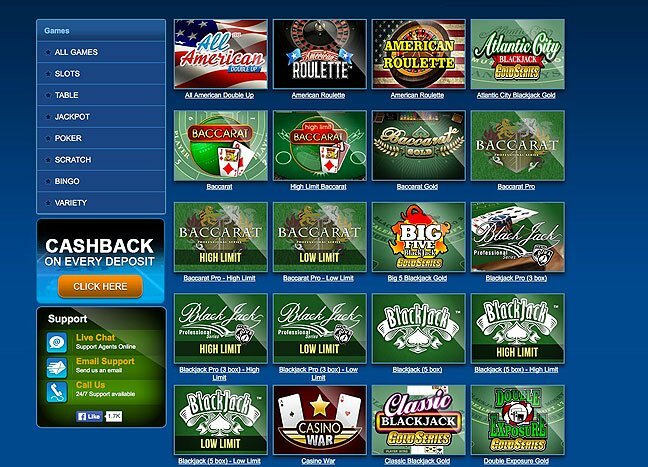 Then try blackjack games and enjoy a real-like gambling experience. A good news is that all the titles, except for progressive pokies, can be played in a demo mode, and with no download needed. 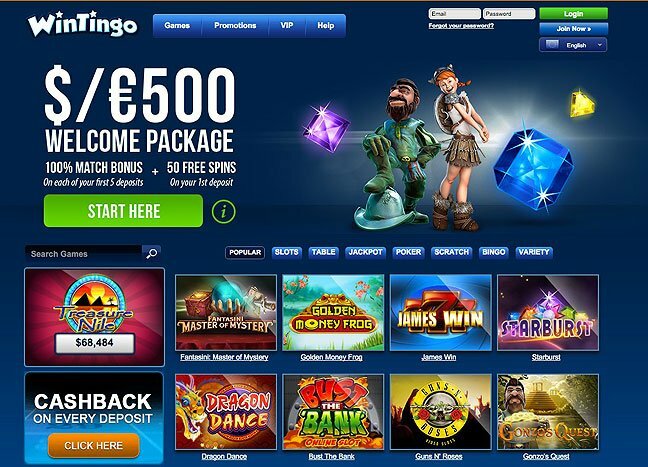 The casino offers a lucrative welcome package for a good start into the gaming experience on the WinTingo website. On signing up, new players get a 100% match bonus applied to the first five deposits. With the maximum bonus amount of $100 (or 100 euros depending on personal settings), first-comers can look forward to earn $500 in bonus money. 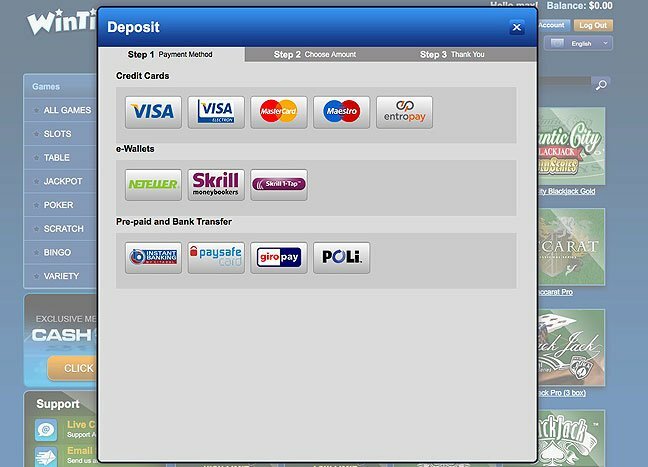 Furthermore, transferring the first deposit to the account, you can claim 50 free spins. To get the bonus amount, you need to play your deposit 40 times – this is a standard wagering requirement for all deposit match bonuses. The casino rewards users with comp points (or Cashback as it is called on the website) that can be redeemed to cash. For every $70 staked, 2 comp points are automatically added to your balance. When accumulating at least two points, you can convert them into real money, with one point being equivalent to $1 in cash. There is a VIP Club (High Rollers Club) that provides a handful of perks to its members, e.g., a more beneficial comp points exchange rate, access to exclusive bonuses, faster withdrawal processing times, etc. The casino does not specify clear VIP qualification requirements, but we suppose they factor in your deposit amounts and turnover. To check if you are eligible for membership, you should send them an email request. The casino holds a valid gaming license issued by MGA (Malta Gaming Authority) and creates a protected environment using advanced SSL 128-bit encryption technologies, which is proved by prestigious SSL and EV certification. This means that all transactions and personal finance details are stored in a secure server protected by most up-to-date firewall systems. WinTingo states that the payout rate for all games on offer is an average of 95.5%. 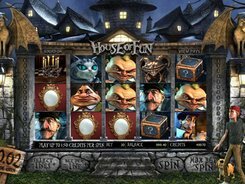 On the Responsible Gaming page, they have a few links to pdf documents containing factory RTPs for all titles offered by the casino. You have three options to get in touch with the support team: 24/7 live chat (available for registered users only), email support and a phone call (some calls are free depending on your location).